So if it wasn't Donald Glover, who was dressed as Teddy Perkins at the Emmys? 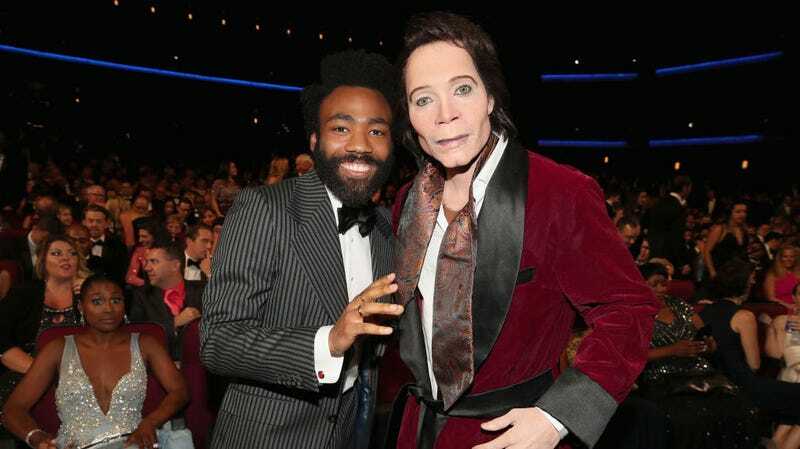 Teddy Perkins, an Atlanta character too unnerving to ever forget, put on his finest velvet robe and splashed some water on his horrifyingly immobile face to enjoy a rare night out at last Monday’s Emmy awards. Those who watched, intending to enjoy a relaxing evening of giving awards to the wrong shows and improving Netflix’s stock prices, assumed it was Donald Glover himself reprising the role, but were soon shocked to see Glover standing alongside the ostrich egg connoisseur and former music biz legend. This raised a big question, which is important to ask when it comes to Teddy Perkins, of who, exactly, was beneath the fish-eyed death mask. Attempting to calm itself, the internet began speculating that Perkins was one of Atlanta’s male cast members. The obvious candidates included Lakeith Stanfield, who starred in the Perkins episode, or Brian Tyree Henry, another main character. Some hoped, after photos disproved both these guesses, that it was director Hiro Murai. Unfortunately, it was not. Desperate for reassurance, Zazie Beetz was guessed next. It was not, we’re sorry to say, Zazie Beetz. But, so far, nothing. It’s not SNL alum Jay Pharoah, and it could, according to current theories, be anyone from Atlanta’s writers and editors Jamal Olori and Stephen Glover to, well, millions of other choices from across the entire planet. For now, we’ll simply have to wait and see how the internet’s investigations continue. In the meantime, it’s probably a good idea to pass on any free piano offers that require pick-up at spooky old mansions. Maybe this guy is real.